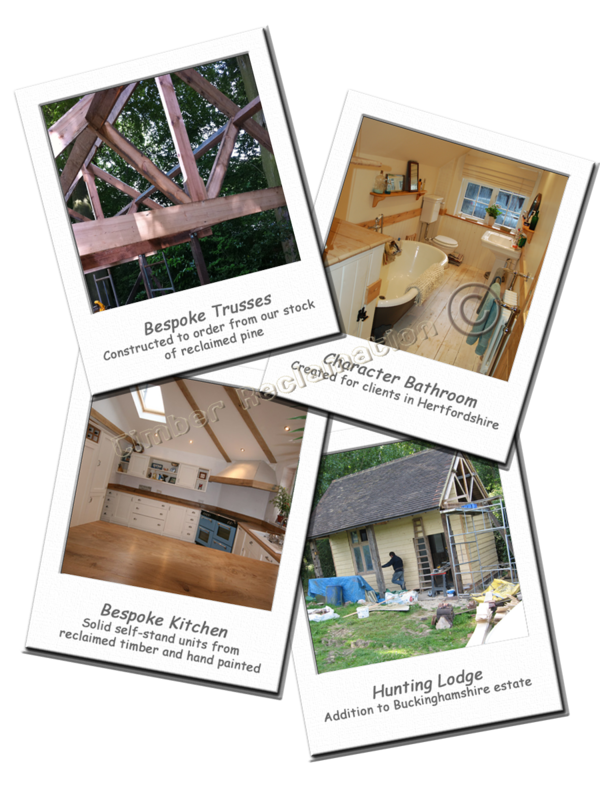 TR has a skilled team of craftsmen proven in the restoration of vintage building, the construction of ‘new’ timber-framed, buildings (made from reclaimed timber of course) and a multitude of ‘design projects’ for Home, Office and Gardens. 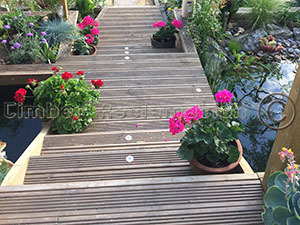 Our Hertfordshire yard and showroom stocks a rich variety of Reclaimed Timbers, Heritage Artifacts, Vintage Garden Ornaments, Character Bricks, Tiles, Slates, Paving, Cobbles, York Stone and Ironwork. We will be pleased to help you with everything from finding that matching Victorian Fireplace or the right Welsh Dresser to a Full Listed Building Design and Renovation Service. 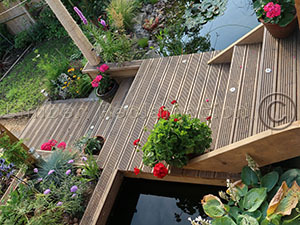 Whether you are looking to simply shop for that special piece or looking for a Complete Design, Supply & Build Service please do not hesitate to ASK US - we will enjoy your challenge. 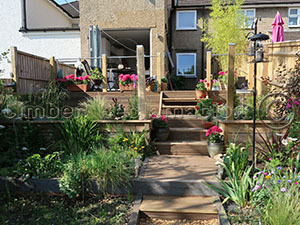 Sympathetic Renovation works and Extensions to period properties using reclaimed building materials wherever possible. 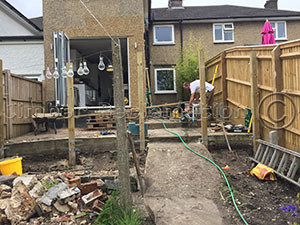 This enables us to Meet Building Regulations, Match the Character of the original building and complete the job in the environmentally friendly way. 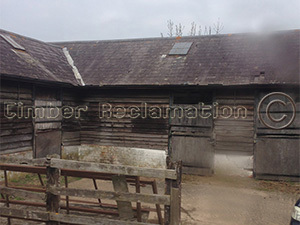 We Convert Barns (see examples below), and design and construct Outhouses, Summerhouses, and Pavilions from Reclaimed Timber. With the skilled use of Traditional Carpentry along with reclaimed bricks, stone and roofing tiles, these buildings deliver ageless beauty which merges seamlessly into period landscapes (or contrast strikingly with modern buildings) whilst ticking all the Green Boxes. Using our in-house specialist interior designers, carpenters and painters (and of course using reclaimed timber, vintage artifacts and heritage items) we can sensitively deliver large and small projects from a complete refurbishment to a single Welsh Dresser. 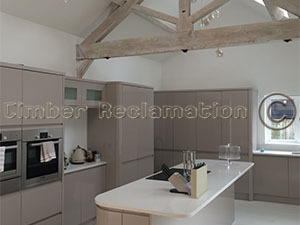 Our service is absolutely BESPOKE - from the choice of solid (reclaimed) timber to any required hand-painted-finish effect including 'Traditional' and 'Shabby Chic' in Kitchen, Bedroom, Dining Room or wherever - as you wish! You can click here to see an example of our recent work in these pictures of a bespoke kitchen in Hertfordshire (all crafted from reclaimed wood). 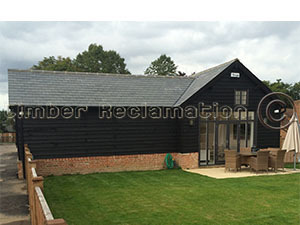 Working with our Architectural Partners The Reclaimed Timber Company enjoy providing a FULL BARN CONVERSION SERVICE from start to finish. 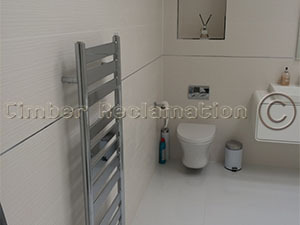 Below are some example pictures of a recent conversion. 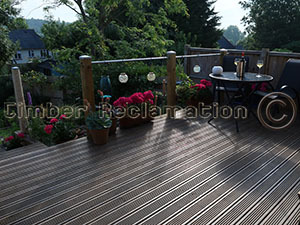 We Source, Craft & Fit matching reclaimed timber. We shielded the work from the elements. 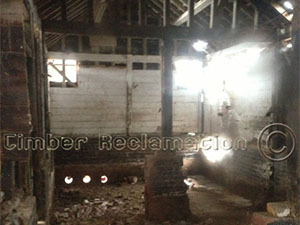 The sympathetic and thoughtful application of our large stock of architectural salvage and our vast choice of reclaimed timbers allows us to restore this old building to its former glory. The French Windows, Doors and some of the Old Beams were also designed and Crafted by The Reclaimed Timber Company to match the beauty of the original features and the bespoke requirements of the client. 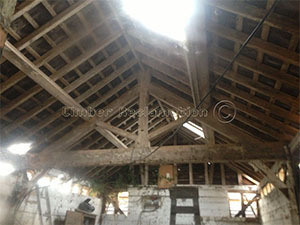 Old bricks, Beams and original features all carefully matched. The beautiful old pine wideboard complements the original. 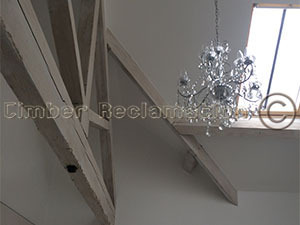 We used reclaimed timber to craft these bespoke French Windows to the specification of the client. 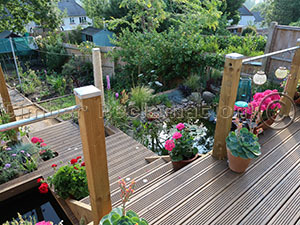 June 2017 showing tansformation of a GARDEN adding DECKING PLATFORMS, STEPS, RAILINGS, PATH and ornamental POND. And Include a Space to Dine & Wine!